Alarm keypads are the user interface for home and building security systems. The keypads can be used to arm and disarm the alarm and check the status of the alarm. Some of these keypads may contain replaceable batteries that provide power to the keypad itself. 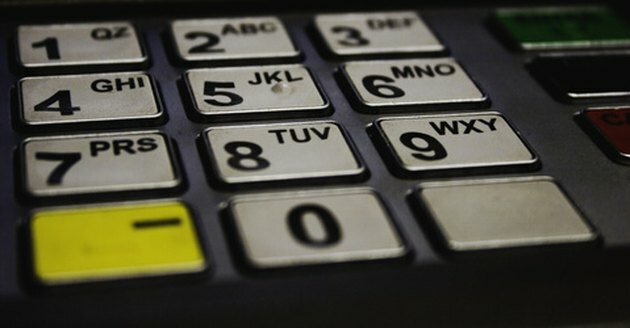 Keypads with backlit keys and displays may contain replaceable batteries as well. If your keypad is beeping or is not functioning properly, the battery may need to be removed and replaced. Alarm keypads may contain numbers and letter keys as well as command keys. Go to your home's circuit breaker and locate the circuit for the alarm system. Flip the circuit switch to the "Off" position. This will prevent accidentally arming or tripping the system. Some alarm systems have their own circuit breaker box installed near the main breaker. Search for the battery compartment access panel on the alarm keypad. Depending on the make and model of the unit, the panel may be on the side of the device or accessible when the keypad cover is opened. If you see no access panel for the battery, gently use your hand to pry the front cover off the keypad, revealing the inside components. Pop the battery out of the battery compartment. Some compartments may allow the battery to be slid out. Depending on the make and model of the keypad, the battery may be a standard AA or AAA battery or it may be a computer or watch-style battery, silver and round. Hold the replacement battery so that the "positive" end lines up with the "positive" terminal in the battery compartment. Pop or slide the battery into place, ensuring it is fully inside the compartment. Replace the keypad cover or the battery compartment access panel. Switch the alarm's circuit breaker switch to the "On" positon. Press the "Menu" or "Settings" button on the keypad and navigate through the menu to reset the date and time as well as alarm schedule if your system is equipped with such features.